We are always wanting to give the best to our skin, buying the latest skin scream and cleansers but it’s time to give our bums what they deserve. Even the softest toilet paper can’t give your bum a break like Sterling Global Products Flushable Wipes can. I would choose the Bonde wipes. I would choose Adventure wipes for toddlers. 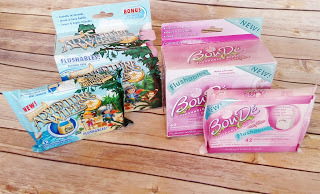 I’m going to go with the Bonde wipes! I would choose the Bonde (Womens) wipes if I won.